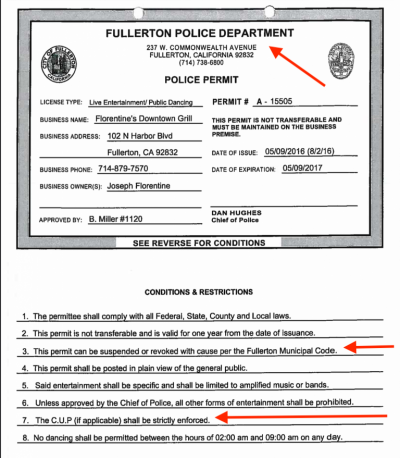 Every single year the Fullerton Police Chief, currently Robert Dunn, issues Florentine a Live Entertainment Permit threatening to enforce the applicable laws/permits. And every year the Chief does nothing but wield his rubber stamp for downtown law breakers. This is worse than the old joke of the UN saying “Stop! Or we’ll yell ‘Stop!’ again!” because our Chief can’t even be bothered to use the “S” word. 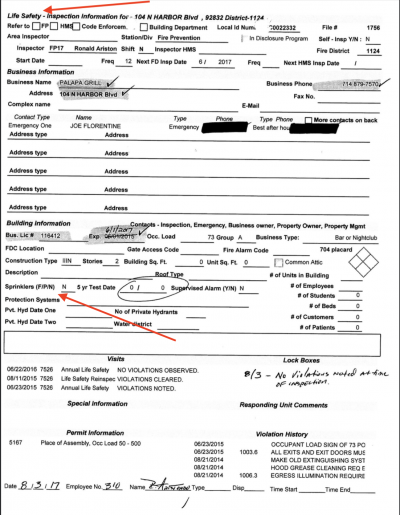 Every single year the Fullerton Fire Department does a “Life Safety Inspection” of Florentine’s properties and every year they ignore the lack of fire sprinklers because their rubber stamp is as useless for safety as the Police Chief’s is for enforcement. Maybe these heroes want more people to be put at risk? Every year our Planning Commission & City Council promise to look into Downtown and to try to “fix” the problems and yet Joe Florentine has operated the largest night club without FIRE SPRINKLERS all while our Planning Commission and Council do nothing but make things easier for the bar owners. Florentine’s CUP should have been revoked in 2009 before he passed a year of non-compliance but here we are in 2019 and our bureaucrats, under the current authority of City Manger Ken Domer, sit idle and make excuses while telling us lies and going to bat for bad actors. Why? We here at FFFF aren’t anti-downtown. We’re not anti-bar. We’re tired of moneyed and arrogant jackholes like Joe Florentine running roughshod over the rules – the very rules that are used to punish other less connected businesses. We’re tired of his “Move to Podunk” arrogance and cavalier attitude. Is every business that complied with the fire sprinkler law going to get reimbursed for their costs? Is the city going to cover the liability should another Florentine business burn to the ground? We’re tired of the Police, Fire Dept, Planning Commission, City Manger and City Council all being complicit in cronyism and corruption. All being too lazy or too corrupt to do their jobs or even ask tough and pointed questions. We’re tired of guys like Ted White telling commissions and council how hard his job is when all he’d have to do is send a letter from his cozy desk to solve a life safety issue. Why can’t he do that? Why is one bar so important in such a saturated area? 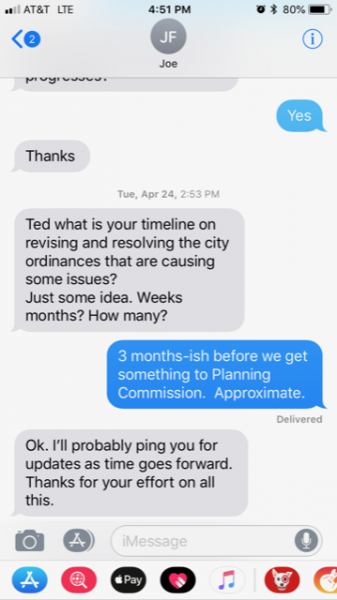 If Ted White sent one letter demanding action – on a life safety issue that his office has ignored for over a decade – and Florentine refused to comply then a single bar in Downtown would lose a single Conditional Use Permit. Is that going to break downtown? Is that going to further break our already broken budget? Is Joe Florentine so important that every single city agency – code enforcement, police department, planning commission, city council, fire department, community development, building department – all of them need to turn a blind eye to blatant acts of arrogance and rule/law breaking? 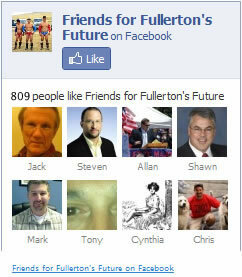 Aren’t you, the people of Fullerton, tired of this disparate enforcement? This favoritism? The arrogance on display? If so then say something. Demand action. Ask tough questions. Demand to know why life and property in Downtown can be put at risk so one guy can profit. Tell your council that you’re tired of their lies and their handouts to the connected and favored businesses. Tell them you won’t vote for them or their allies if they continue to arrogantly pervert the system that is supposed to represent all of us – not just those of us with the means to purchase their strings. Stop playing ball and starting holding feet to fires. Otherwise your city isn’t yours. Fullerton should belong to the people of Fullerton and the future and it’s long overdue that our government started acting accordingly. Who cares about DUIs, potholes, and smoldering disasters waiting to happen. We want pretty pictures and a cocktail with a splash of privilege. Maybe a new haircut to brighten our self-esteem. That’s who we are. We’re shallow, we’re apathetic, we’re Fullerton. Which company is providing fire insurance for this building? Give them a call. Does Ted White attend council meetings? If so, what are his responses specific to Florentines and all these tough questions? Actually DTF can easily afford to lose Florentine’s shithole. It costs the citizens more to have it there than it brings in tax revenue. The same applies to every other bar/club in DTF. Recall when, back into the era of the coming of the new millennium, the excuse for installing fire sprinklers was that the water pressure was inadequate for fire lines. So, the Fullerton Redevelopment Agency then pimped for the bar owners and paid somewhere around $1,400,000 to upgrade the water mains in the alleys behind the bars on both sides of Harbor so that they could put in fire sprinklers to comply with the laws. The new mains were installed and paid for with money stolen from housing for the benefit of scumbags. Look and you will see how the City Staff lied to you gullible mortals and wasted your tax increment. Very sad. Cronyism top to bottom. Terry Galvan must be rolling over in his grave. TG is alive and well. Having lived in the Fullerton area for most of my adult life, only recently has this board come to my attention. I wish I had known about it sooner, that I would have warned a friend of mine to stay away from that place. However, the upshot is that, because of her, I now have it on good authority of the kind of man Joe Florentine is. She says that lack fire safety, while important, is only the tip of the iceberg. She witnessed instances where staff were sexually assaulted, and told “Boys will be boys” by Joe when they brought up the situation to him. She had her paychecks manipulated by Joe, meanwhile having a kitchen staff full of people using falsified documents to work well beyond CA’s legal limit. She was told not to ring up cash transactions during club nights, and that it would be “taken care of later” by Joe. She watched as Joe would pay his staff, including his security, under the table at the end of the night instead of having them fill out tax paper work. Best of all, she said that there was no “workers comp” with Joe, but that those injured on the job would be rushed to a veterinarian for care, and that anyone who took themselves to an actual hospital would be yelled at and threatened by Joe for having done so. I think that, even with the “limitations” set on him by Mario (who I have not heard great things about either), Joe has still continued to make changes to the building. I can only imagine what the health inspectors think, seeing as I’ve heard his new projects, what used to be the pool room and Tuscany (now a ‘speakeasy’ and ‘lounge’) have had issues with flooding. Having heard her stories, I would always wonder how it was that a guy like that could stay in business. Now, though, I start to see how. Thank you Anonymous. All that about Joe doesn’t surprise me in the least. Right now is exactly the time for the city to grow a pair and take back that sidewalk Florentine STOLE from the residents of Fullerton and shut down that place for code violations until it gets fire sprinklers. 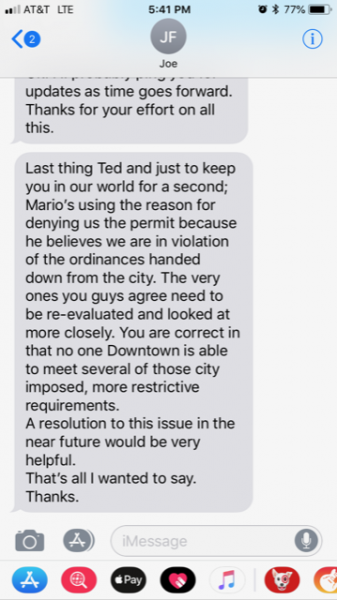 Does Mario curry any favor with the city? Also: I knew Ted White was a dirty shill the first time I laid eyes on him. The city isnt going to grow a pair. The only thing that will lead to action is if they sufficiently fear the consequences of letting it go on. he does have very shifty eyes.